This illustration shows the absorption of X-rays from the quasar Mkn 421 by two intergalactic clouds of diffuse hot gas, and a portion of the Chandra X-ray spectrum of the quasar. 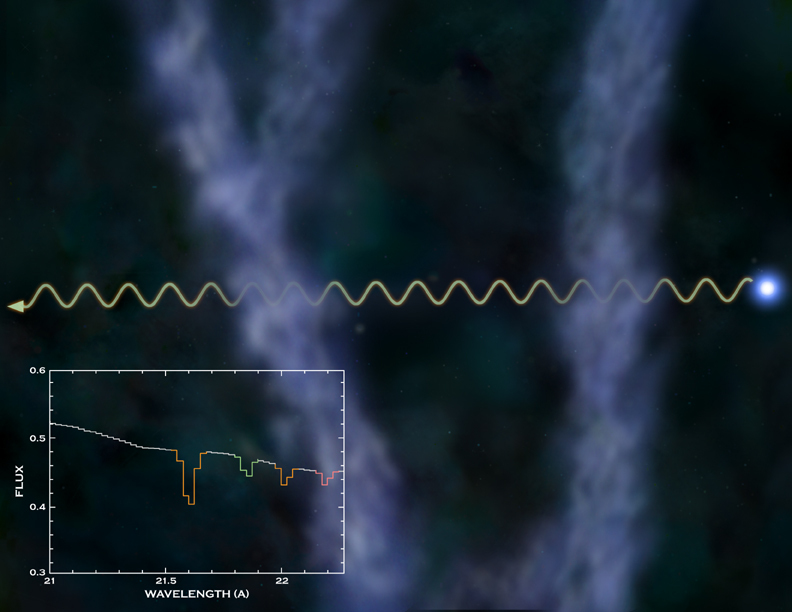 The spectrum provides evidence that three separate clouds of hot gas are filtering out, or absorbing X-rays from Mkn 421. 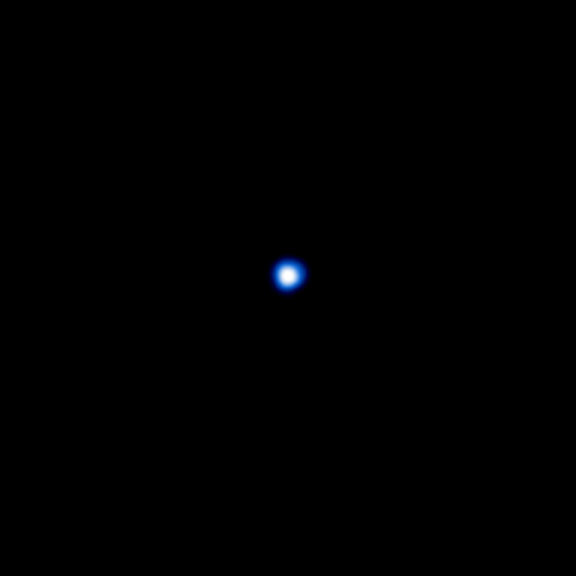 Dips in the X-ray spectrum are produced when some of the X-rays are absorbed by ions of oxygen in the hot gas clouds which are located at various distances from Earth. The orange dips are due to absorption in our Galaxy, or in the Local Group of galaxies. This cloud is at most a few million light years from Earth, and is not shown in the top illustration. The green and red dips are from clouds at distances of 150 million and 370 million light years, respectively. The distant clouds are likely part of a predicted diffuse, web-like system of gas clouds - the cosmic web - from which galaxies and clusters of galaxies are thought to have formed. X-ray absorption by ions of carbon, nitrogen, oxygen and neon in the clouds was detected in the complete X-ray spectrum. The clouds have a temperature of about 1 million degrees Celsius. Combining the X-ray data with data from observations at ultraviolet wavelengths allows an estimate of the total number of atoms and ions of all types in the distant clouds. This estimate shows that the clouds have a thickness of about 2 million light years, and contain an enormous mass of atoms and ions. The Chandra X-ray spectrum of Mkn 421 provides strong evidence that a large fraction of the atoms and ions in the Universe are located in the cosmic web, and may point to the solution of the "missing matter" problem. The missing mass problem - not related to dark matter or dark energy - was discovered when various measurements gave astronomers a good estimate of the number of atoms and ions in the Universe 10 billion years ago. However, inventories of all the atoms and ions in stars and gas inside and outside of galaxies in the present era yields only about half as many as were present 10 billion years ago. Almost half the atoms and ions in the Universe had gone missing! Assuming that the size and distribution of the intergalactic X-ray absorbing clouds discovered by Chandra are representative, it can be shown that most if not all of the missing atoms and ions are hidden in the hard-to-see cosmic web. Coordinates (J2000) RA 11h 04m 27.30s | Dec +38° 12´ 31.80"